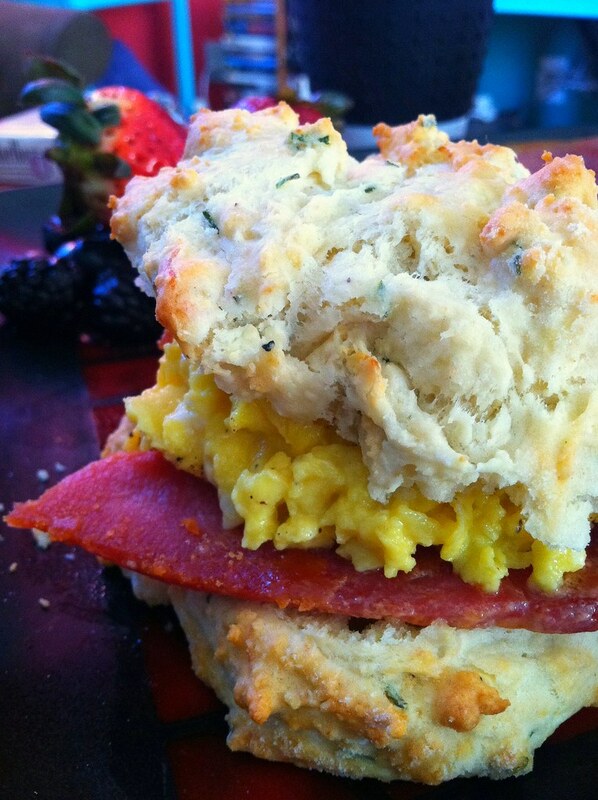 cheesy breakfast biscuit sandwiches! – ugly food tastes better. Sunday Brunch! 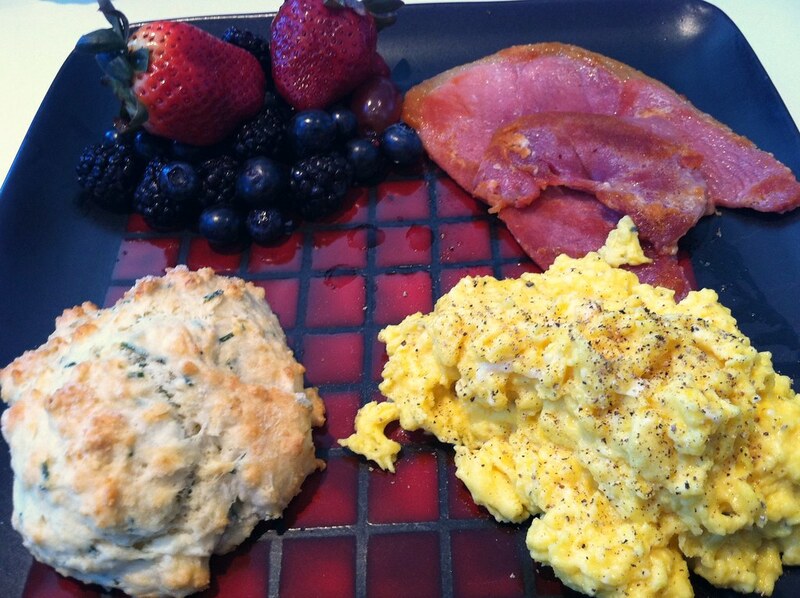 goat cheese and chive breakfast biscuits filled with country ham and cheesy scrambled eggs served with fresh berries. So I am big on not wasting food, and I wanted to share what I am doing with leftover cheese from the Jarlsberg Sculpture I made for the IACP launch party last week. The Chevrai went in to these amazing biscuits, and the Jarlsberg shreds went in to these super fluffy and delicious scrambled eggs. Sunday brunch is one of my favorite things ever, I love waking up whenever, putting some music on and cooking in my PJs while singing to myself. Paired with the country ham I brought back from my trip to North Carolina, this made for one of the best breakfast sandwiches I have ever made! And I have made A LOT. I took this fabulous recipe from Simply Recipes. I had had my eye on it for awhile, and we used it for the biscuits for the party last week. I tweaked it a little, of course, and I personally do not keep buttermilk in the house. I don’t use it often enough to be necessary, and its incredibly easy to make. Before you start this recipe, pour slightly less than the cup of milk called for into your measuring cup and add a tablespoon of either lemon juice or white vinegar to it, and let it sit until ready to use. Nutrition – this is a happy meal, not a healthy one! But good energy to start the day. Best to eat food like this when you still have time to work it off! Preheat your oven to 400 and mix your dry ingredients in a bowl, add in the little cubes of butter and toss them in the flour, then squish them between your fingertips in the flour. 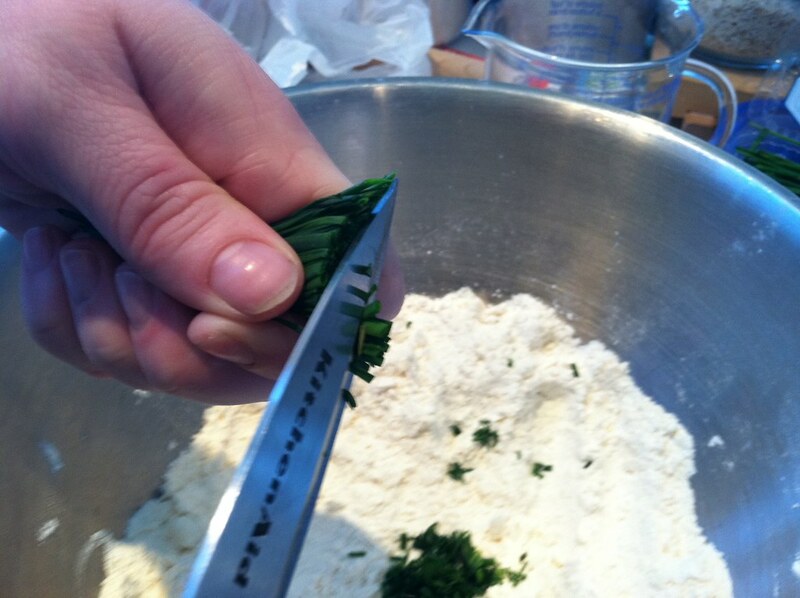 Then I like to use my kitchen scissors to cut the chives in to the bowl. 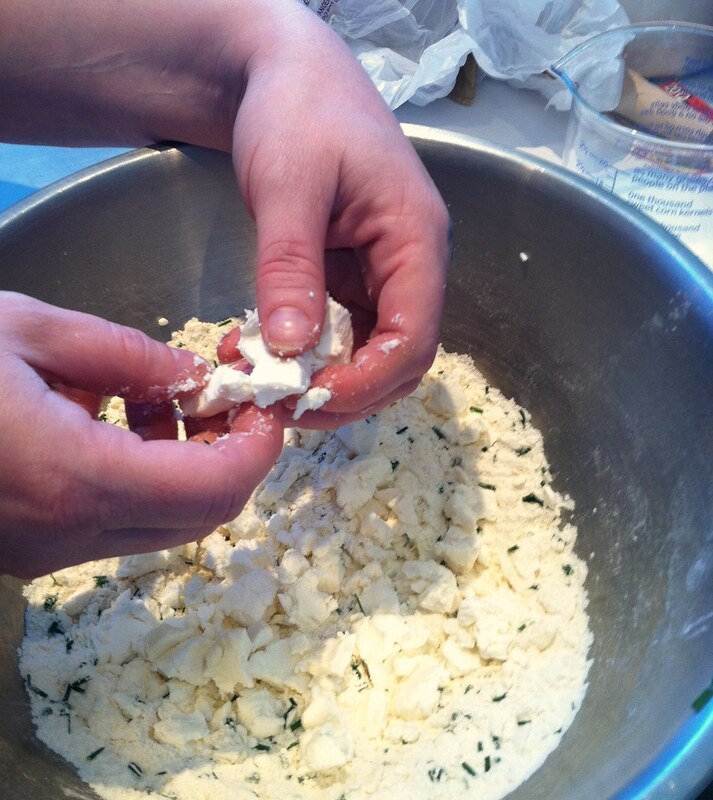 After this, add in the goat cheese with your fingers, crumbling in to little chunks. 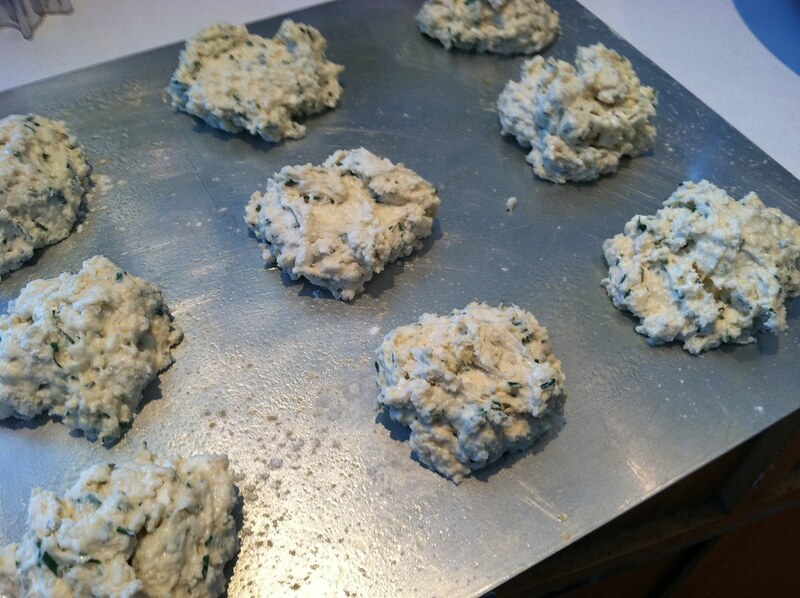 I like to use the same method as with the butter, tossing them in flour and squishing them a bit to incorporate. 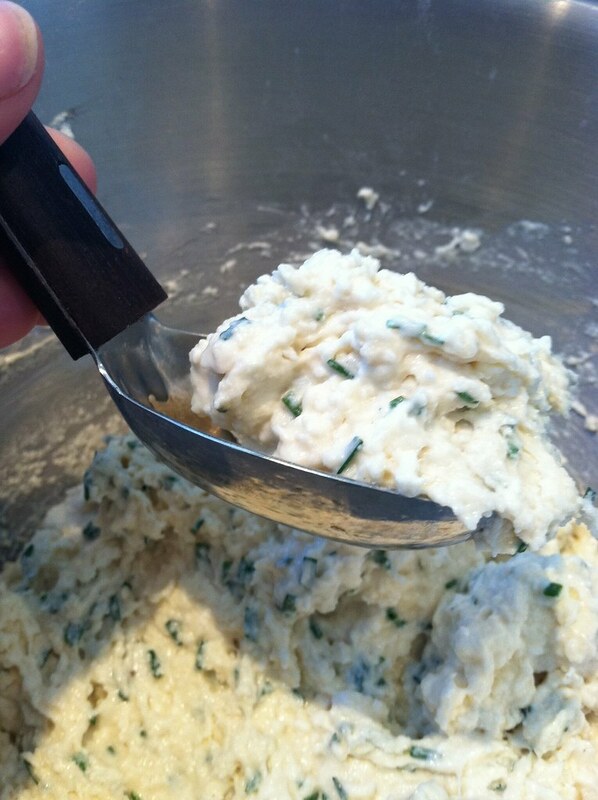 Then add your buttermilk and mix until sticky with all the dry ingredients mixed in well. I like to use a Chinese soup spoon to scoop out the dough and plop it on to a greased baking sheet, its the perfect size and shape in my opinion, and I like these biscuits to have a rough shape to them, like little piles of happiness. I made 9 piles on my baking sheet and baked them for 22 minutes, yours might cook faster, or need a longer time, as I have a crappy convection oven. Take them out when they are golden on top and bottom. While these are baking, heat a non-stick skillet and cook your country ham. This super salty ham is one of the first things on my list to get when I visit my family in North Carolina. It will cook in its own fat, and make your kitchen smell like heaven. While it cooks (about 15-20 minutes) crack 6 eggs in to a measuring cup and beat with a fork. Add your milk, cheese and black pepper and stir. When the ham is fully cooked, transfer it to your serving plates and add the eggs to the same pan, using the leftover ham fat to cook the eggs. I like to cook my eggs until they are still nice and wet, dry eggs skeeve me, but do as you please! Plate your eggs, and since your oven should be beeping about this time, add a biscuit and some fresh fruit to complete your beautiful brunch plate! NOW GO ENJOY YOUR CHEESY BRUNCH!!! Oh my gosh! You won’t believe this, but I had leftover cheese from New Year’s so I made drop biscuits with chives and the rest of my Irish bacon. I was going to post them later this week, but in all honesty, yours looks way yummier! For biscuits, I defer to the Southerner! Pingback: House of Jarlsberg | ugly food tastes better. Ooooh I dont know, yours sound pretty epic! 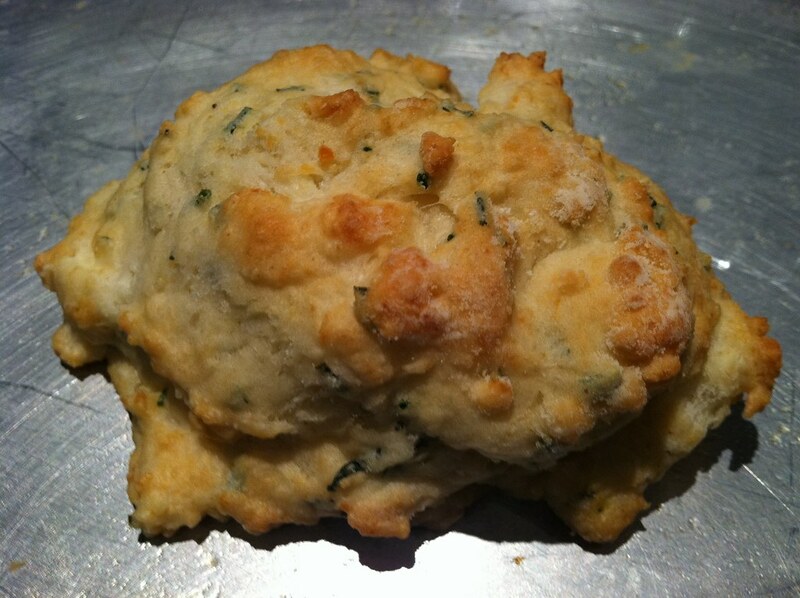 but yes, my barefoot redneckness does make biscuits easy for me. That and a super awesome g-ma that taught me to make them when i was still practically a baby haha. I beg to differ: a Chinese soup spoonful is an extremely accurate measurement! Pingback: FONDUE! | ugly food tastes better. Pingback: BK Swappers latest swap! | ugly food tastes better.